Thread chasing is a very rewarding and worthwhile skill to acquire. 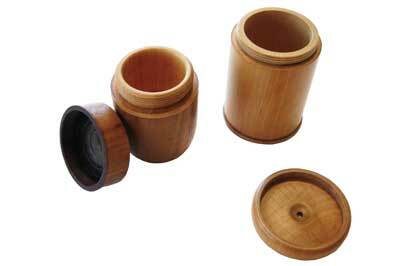 You may have heard it said many times, just how much it can extend your repertoire of woodturning items. That said, it requires practise, careful measurement, and an understanding of the relationship between the traverse rate of travel of the chaser, to the speed of lathe rotation. I came up with these 10 most important steps as a result of some disastrous results when I was learning to cut threads. I was left wondering whether the problems I encountered were due to sharpening, speed of the lathe, how I was moving the thread chaser etc. Within this article, I have tried to break the process down into a logical, easy-to-follow sequence that should put you on the path to creating the perfect thread. Now it may seem a simple thing, but some lathes just don't have a low enough bottom-end speed to allow you to cut threads easily. 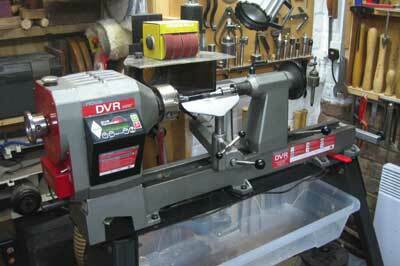 A lathe speed of between 200-500rpm is generally considered to be ideal. Variable speeds are becoming more commonplace, but if your lathe only has one low speed between the above limits, then you can adapt your technique accordingly. Chasers come in a range of pitches from four threads per inch (tpi) up to about 60tpi. It is only the middle of this range that is suitable for use on wood - say from 10tpi up to 32tpi. A good starting point is about 18-22tpi. 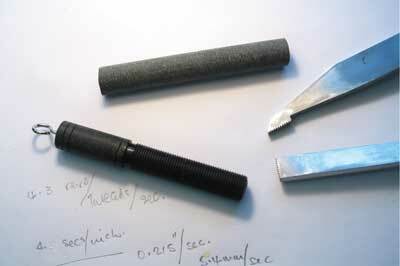 You will need a matching set of chasers for internal and external threads. 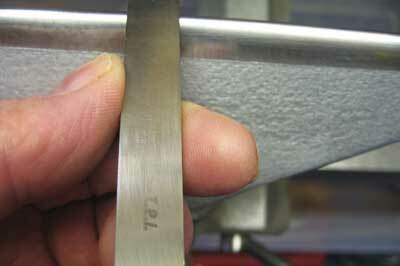 Sharpening can be quite straightforward and for the beginner, I would recommend the flat stoning method to begin with. This should consist of abrading the top face of the tool until it is completely flat. Hold the edge to check that no light falls on it and you will have a sharp tool. A slight bit of grinding may be necessary to remove the leading part tooth on both the male and female chasers. This little refinement will also help the beginner. 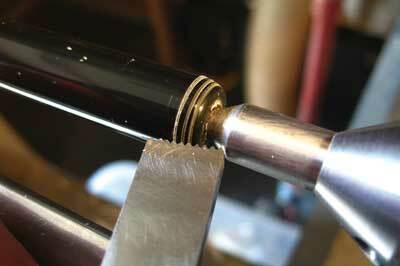 It is very important to gently round the back corner of the tool to remove the sharp edge. This will help the tool to travel along the toolrest and prevent the corners from snagging during the movement along the rest. To be successful, it will be necessary for the chaser to travel sideways along the toolrest. 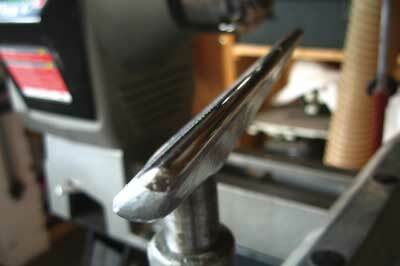 The top face of the rest must therefore be smooth and polished to make this as easy as possible. 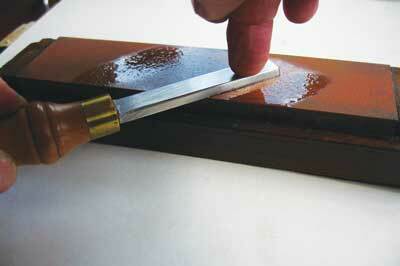 A light application of candle wax can also help the smooth travel of the blade along the rest. I cannot stress the importance of this enough. There are several timbers suitable for thread chasing. Boxwood (Buxus sempervirens) is one of the best available in the UK, but there are others. The requirements are slow growing timber that is dense and close fine-grained: ebony (Diospyros spp. ); African blackwood (Dalbergia melanoxylon); dogwood (Cornus florida); persimmon (Diospyros virginiata); anjan; fruitwoods such as pear and apple, and many more. Have a close look at the timbers available in your area. You could also use some acrylics, Corian and so on. Since there is no grain structure with these manmade materials they can be better to learn thread chasing with than natural wood. You will need to measure the relative sizes of the male and female blanks quite accurately to ensure a good fit between the two threads. 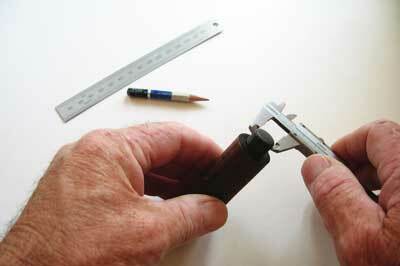 This sounds more difficult than it is, but once you are cutting threads, it becomes straightforward. There is no set order for making the threads, although it is often easier to measure the root diameter of the male thread. If you wish to make the female thread first, then you will need to measure or accurately estimate the outside diameter - the largest diameter of the thread - and to cut a spigot just a little larger onto which you will chase a male thread. In both cases above, it is important to note that the chasers will only cut to the depth of thread; if the finished diameter of the thread is wrong, you can remove the peaks of the threads, as necessary, using a skew chisel or scraper and then re-cut with the chaser. 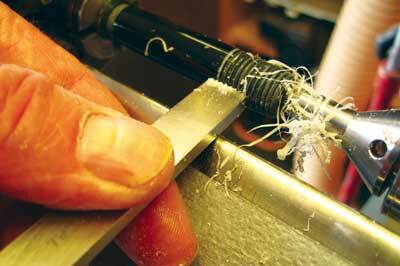 Do not try to alter the diameter of the cut thread with the chasers. This is self-explanatory, but needs to be thought about. 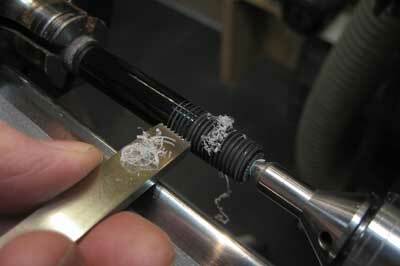 Before starting to chase a thread, try to relax and don't grip the tool too tightly. You need to be comfortable in how you hold the blade so you can make fluid, easy movements along the rest. A bit of preparation can be done to the piece being threaded to make life easier for you. Cutting a chamfer on the lead edge of the spigot or hollow is to help with striking the first threads before progressing along the remainder of the blank. The other is to cut a slight recess at the end of the section to be threaded to allow the tool some clearance to be extracted before the blade hits the shoulder at the end of the thread. 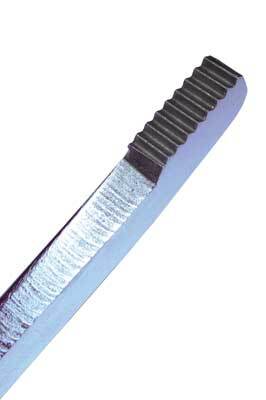 This would result in the blade not being able to move, the timber still turning, and the subsequent destruction of the thread. This recess is the point at which the tool is removed from the work. The recess should only be a little bit deeper than the bottom of the thread and not as wide as to be visually intrusive. Practise will allow you to see how wide you need it to be. 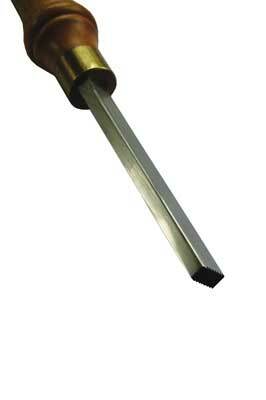 This refers to the rate or speed at which the chaser needs to progress along the toolrest to cut a spiral thread. But the question is, how fast should we be moving the thread chaser? Now it's time for the theory. This correct rate of travel of the chaser along the toolrest - let's call it CRT for short - is a function of the threads per inch (tpi). We have to work in imperial measurements because chasers are still made this way, and the lathe speed in revolutions per minute (rpm). The diameter of the workpiece has no affect on the CRT. The simple answer is that if the initial rate of travel is slightly too fast, there will be too few threads per inch - say 19 instead of 20, if you are using a 20tpi chaser - and because the chaser can only match 20tpi, no more and no less, then the tool cannot cut cleanly but will plough into the already forming threads and crumble them away. The same thing will happen if the initial rate of travel is too slow: the pitch will be too fine, you may even get a double start thread - two threads forming instead of one - and the tool will again destroy any threads at the wrong pitch. In order for the thread to work we need to cut one complete thread per revolution of the workpiece. At 260rpm the work has revolved 4.3 times per second (260 divided by 60) and must therefore have ideally cut 4.3 threads. With a 20tpi chaser, the pitch of each thread is 1/20th of an inch (0.050in) 4.3 x 0.050 = 0.215in. 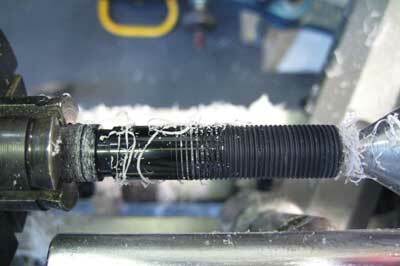 We can say that to cut a 20tpi thread of any diameter with a lathe speed of 260rpm, the CRT = 0.215in per second, or 305mm (13in) per minute. Don't worry if this is all getting too theoretical, it will become clearer. 2. Keep the CRT constant for all tpis and vary the rpm. This will come with practise but be bold, don't be timid. But assuming all the other nine points are understood, the first thing to do is to select the appropriate lathe speed, switch the lathe on and strike the thread. The blade is presented at 90° to the chamfer and is moved along the rest in an arcing manner around the chamfer until the cutting edge is parallel/inline with the main section to be cut. The blade at this stage is traversed along the rest to cut the area to be threaded. One trick is to make multiple light passes across the work making the thread deeper with each pass, and remembering to remove the blade as you reach the recess. This motion of moving along the rest and taking the blade off and reapplying it is almost a fluid, oval motion. Continue this process until you have reached the end of the area to be threaded. Remember that your CRT is now the same for all tpis, so you need to adjust the rpm according to the tpi you want to cut. To do this you simply multiply the tpi by your own CRT, e.g. 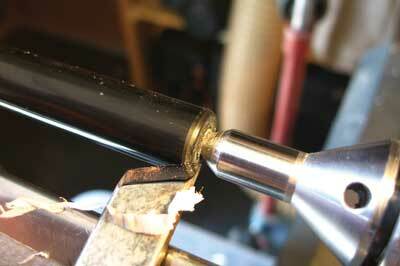 if your CRT is 15 and you need to cut a 16tpi thread, then the lathe speed is 16 x 15 = 240 rpm. To cut an 18tpi thread would be 18 x 15 = 270 rpm. In my own case, my CRT is 13 and the table below gives the corresponding lathe speeds for each tpi. I could also mark each chaser with the rpm. This means that I can practise and have reference to this very important rate of travel and get better, more consistent results. The CRT will vary with each thread pitch, but it should be quite easy to determine the rate required from the above procedure. Understanding the relationship between revolutions and lateral movement is fundamental to cutting good, clean threads in wood.